This spring I was delighted to be asked to be a part of one of the loveliest projects I could imagine. There’s a health food store in Saratoga Springs, NY called Healthy Living, which occupies the former JC Penny retail location in the Wilton Mall. Healthy Living sells organic and artisan foods, much of it sourced locally from small farms, and the Saratoga Springs community has been radically altered in a positive way since Healthy Living opened in 2012. This spring I was asked to renovate the landscaping, I designed and installed edible gardens, native plant herb gardens and a pollinator garden to encourage and support the vegetable gardens. After planting the pollinator gardens, it occured to me that the site could now easily qualify for Monarch butterfly waystation status with Monarch Watch. Though it hadn’t been premeditated, we had 100% of the national organization Monarch Watch’s requirements for habitat waystations for breeding and migration, including 3 types of Milkweeds that can serve as Monarch host plant, many other types of native plant species to provide nectar for adult butterflies, native trees and shrubs that can offer shelter for butterflies to hide and form cocoons and chrysalis, and an absence of pesticide use. The Monarch butterfly waystation at Healthy Living Market in Saratoga Springs, NY is a bold, progressive use of public space, a beautiful statement by the store’s proprietors which demonstrates leadership on local environmental issues, and by extension expresses the fact that the store’s proprietors obviously care about the physical health of the entire community. 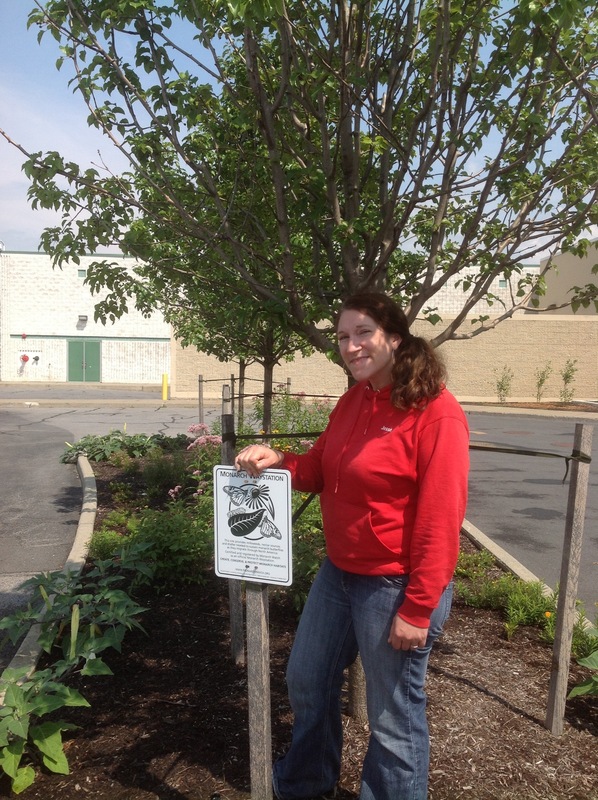 The site is now a certified Monarch waystation site, registered with Monarch Watch. Once the habitat gardens have been established for a couple years, there’s great potential for the site to be very productive as a wildlife corridor. This far, I’ve observed an increase in dragonflies and docile, native bees in the landscaping, but not a lot of butterflies yet. 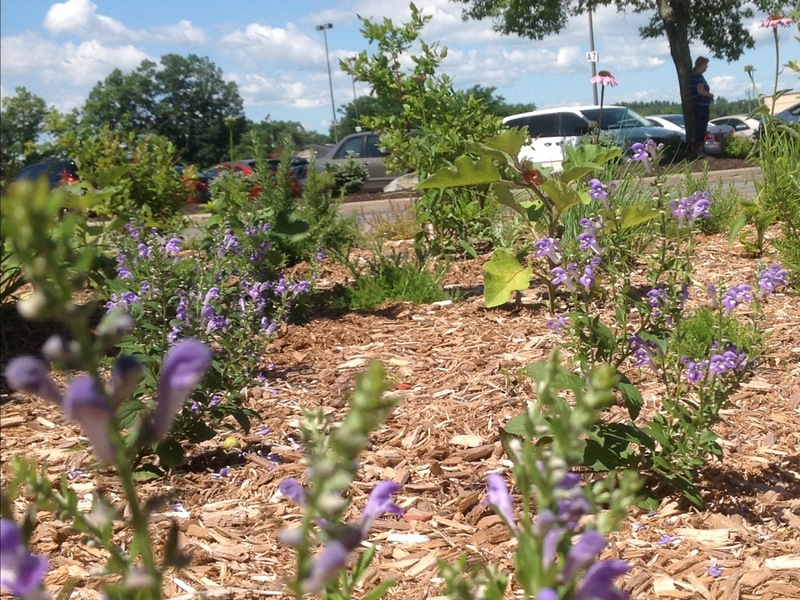 All the years of asphalt jungle-land may have the neighborhood butterflies a little shy about visiting; this kind of Monarch waystation in a mall’s landscaping is rare and the butterflies need a little time to discover the rich habitat treasure that’s here. But when I look at the region from a bird’s eye view, I feel confident that the butterflies will definitely make an appearance at some point. The mall’s property is surrounded by forest on the east and south, and there’s ecologically rich wetlands right on the property at the southwest edge. The Wilton Wildlife Preserve is about a mile east of the mall on Route 50, and the Bog Meadow Brook Nature Preserve is about the same distance on Route 29, southeast of the mall. Downtown Saratoga Springs is loaded with parks and wild spaces, including Congress Park and Saratoga Spa Park. All these preserves nicely form a patchwork quilt of safe space for wildlife habitat, known in ecology as a “wildlife corridor,” and now the extremely commercial mall parking lot outside Healthy Living has been transformed into another piece of the ecosystem quilt. Bravo and hooray, Healthy Living. If more businesses start thinking and behaving like you, the Monarch butterfly population may just make a comeback in a few years. Some of the plants are both, edible and ecologically functional, like these Hops vines. Hops (Humulus lupulus) is a NY native plant that is of course used in the beer making process. (Will Healthy Living one day try their hand in the local beer brewing game with Hops grown onsite?) But Hops vines are also an important butterfly host plant for many of our native butterfly species, including the Question Mark butterfly and the Eastern Comma. 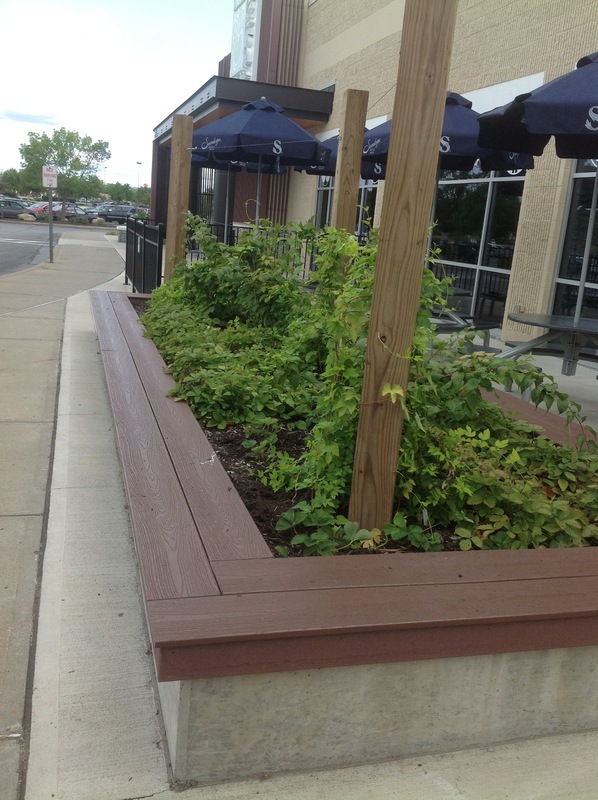 This raised bed also has Strawberries, Kiwi, Raspberries. Skullcap (Scutellaria incana) is a NY native species that’s used medicinally and has a very long, and very beautiful bloom cycle. We use many different kinds of native plants to try to ensure that something is always blooming for the butterflies to have access to precious nectar….and also because it’s nice to have something flowering all the time in any landscaping or garden area. In the Monarch waystation island bed, the Echinacea purpurea (Purple Coneflower), Monarda spp. (Red and White Beebalm), Coreopsis rosea (native Pink Coreopsis), Eupatorium maculata (Joe Pye Weed), Heliopsis helianthoides (Ox-Eye Sunflower), Asclepias incarnata (Swamp Milkweed) and Asclepias tuberosa (Orange Butterflyweed) have been blooming for weeks or even months; when they cycle through there will still be fresh color with the late blooming Vernonia noveboracensis (NY Ironweed), Eupatorium hyssopfolium (Hyssop-leaf Boneset), Helianthus tuberosum (Jerusalem Artichoke) and Arnoglossum atriplicifolium (Pale Indian Plantain). 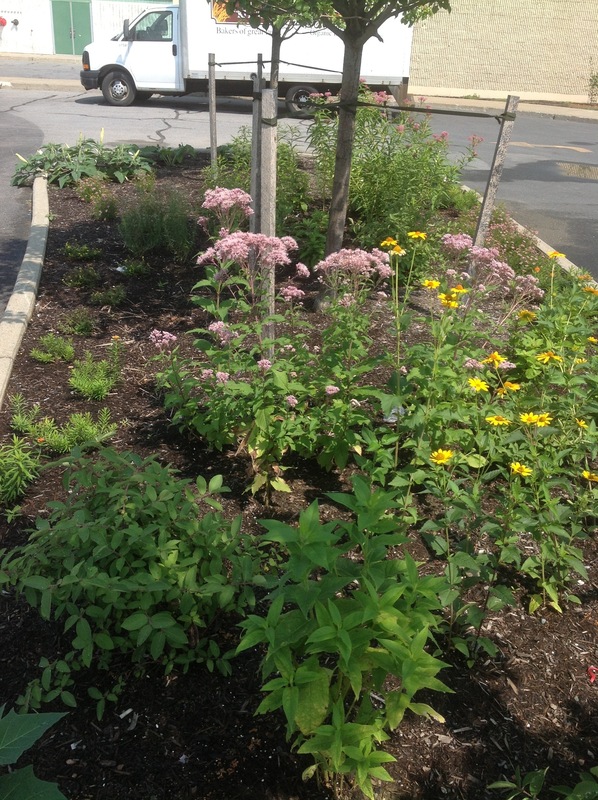 The Monarch Butterfly Waystation at the Healthy Living Market in Saratoga Springs, NY. 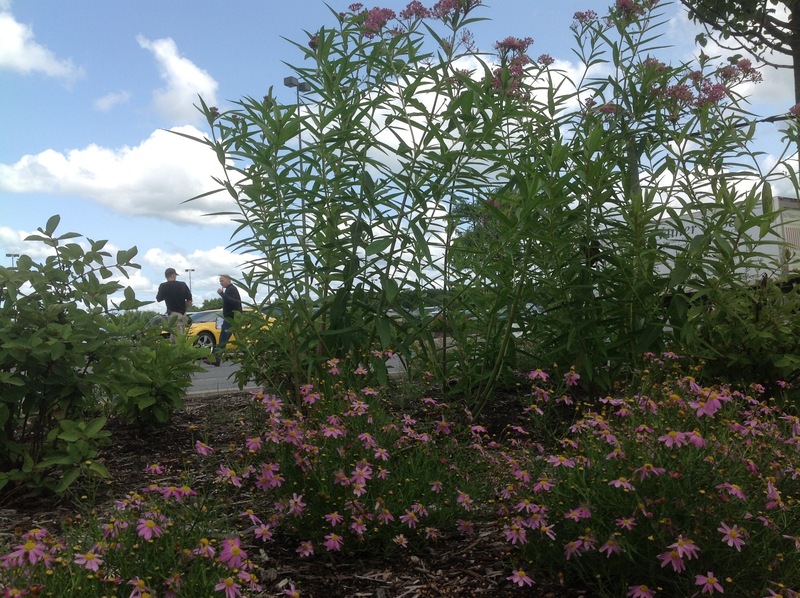 A beautiful, colorful, low maintenance and ecologically productive commercial site.